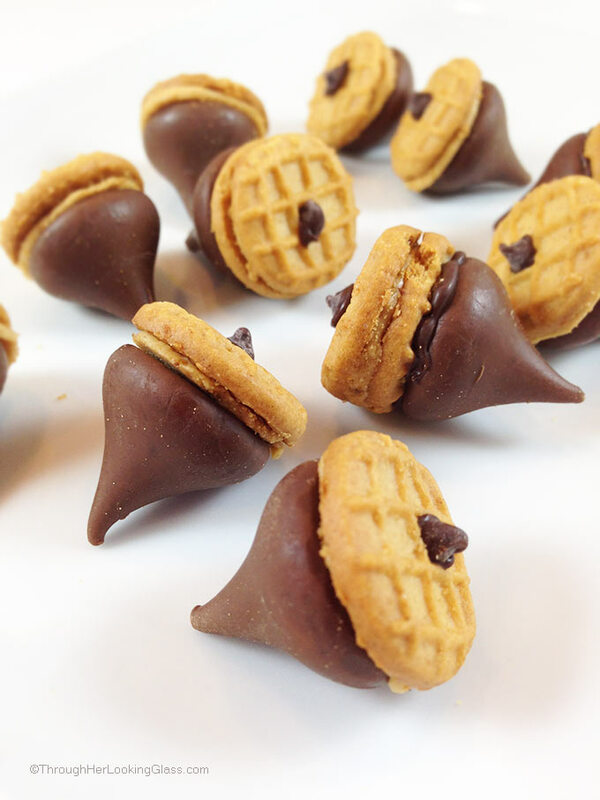 Peanut Butter & Chocolate Acorns. Perfect little bite for kid parties and harvest time. Great DIY kids’ craft. Super cute. Fun to make, fun to eat. Perfect Thanksgiving favor. Fall is so wonderful in New England. The nights get cooler, the days crisper. Around here I’m pulling out my cowboy boots and hunting for scarves. The leaves will start morphing into vibrant reds, yellow and oranges in just a few weeks. So here’s a fun little harvest snack that’s cute and quick to make, perfect to usher in the season. Not labor intensive. Not rocket science. These Peanut Butter & Chocolate Acorns are a fun little bite for harvest and fall classroom parties. We all know peanut butter and chocolate is the best combo. 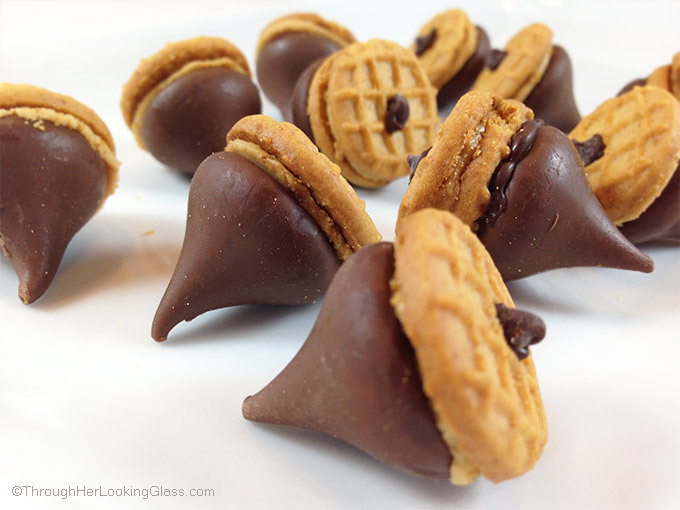 But these Peanut Butter & Chocolate Acorns are also the perfect little DIY craft. For kids of all ages. Super easy. Super cute. Fun to make, fun to eat. Pretty much the easiest snack you’ll ever make. Use melted chocolate as “glue” to assemble the little acorn stems and caps onto the acorns. 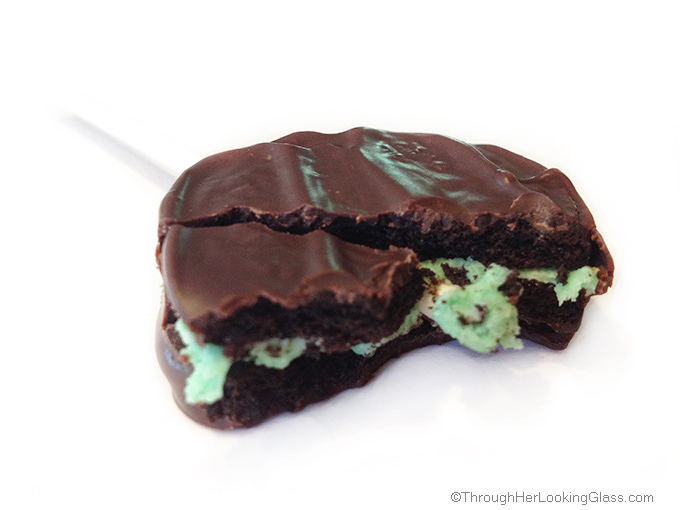 You may use tweezers to add the mini chocolate chip “stem”. The ingredient list is short! 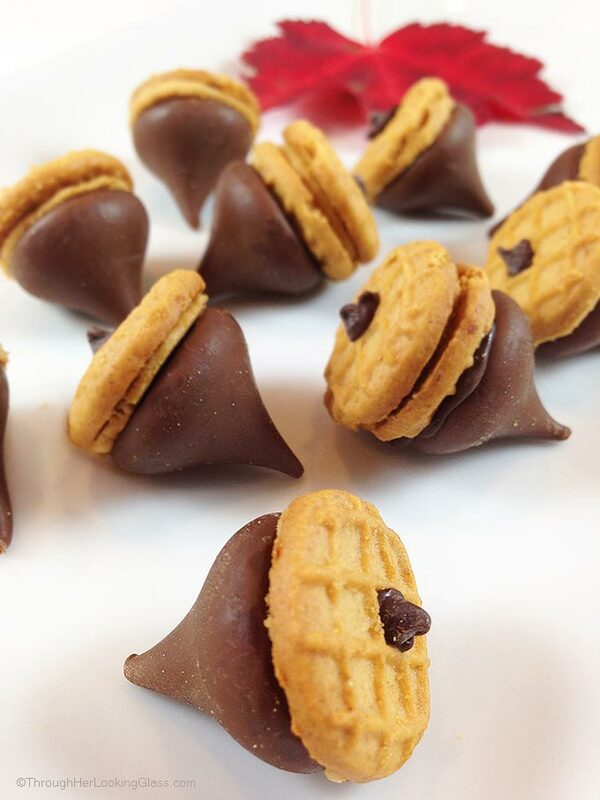 Acorn-gathering squirrels of all ages might just go nuts over these Peanut Butter & Chocolate Acorns! And here’s a clever squirrel you gotta love: Micawber . And a book review (by yours truly). Micawber is one of my favorite children’s books ever. An easy, fun chocolate and peanut butter DIY snack. Yum! In a microwave-safe dish, melt about 1/8 cup mini chips to use as "glue"
Dip mini-chips in melted chocolate and attach "acorn stems" to Nutter Butter bites. 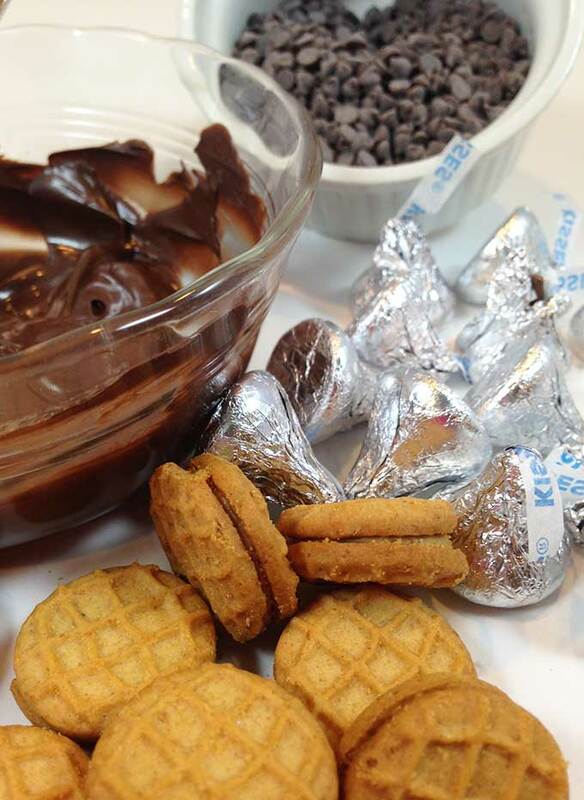 Use peanut butter cookie filling to "glue" Nutter Butter Bite or half Nutter Butter Bite onto Hershey Kisses. Let chocolate harden a few minutes and serve. They are such a cute snack. These are adorable! I love the addition of Nutter Butter bites! Peanut butter and chocolate are so yummy together...very hard to resist! Allie! These look so awesome and something that would be so fun to gift to . well, myself. I am sure my grandkids will love these and no doubt my hubby. Fun! I showed these to my daughter and she is so excited! She is wild for nutter butters and anything chocolate. What a fun and cute idea to make, especially now that all the class parties are approaching. Thanks for sharing! These are soo cute! I love it. I think they would make an adorable Thanksgiving activity! These are the cutest little snacks ever! How creative. Great for all kinds of occasions! Love it!!!! sorry that was from Tracy. Ha! Couldn't edit. I know you knew who. Allie - these are BRILLIANT!!! Simply BRILLIANT!!! I just happen to be a Peanut-Butter-&-Chocolate-Acorn gathering squirrel and I couldn't resist hoarding the whole lotta these! I know many who share your sentiments!!! Alli these are so great! I love a creative recipe like this, and it's so simple. My kids, even though they aren't little any more, will love these. So will my husband for that matter! Such a clever idea! Will have to pass this on to my grandchildren! Thanks so much! 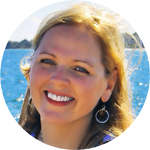 Allie – what a genius idea. These look adorably YUM! Peanut-Butter-&-Chocolate-Acorn are so so delish. 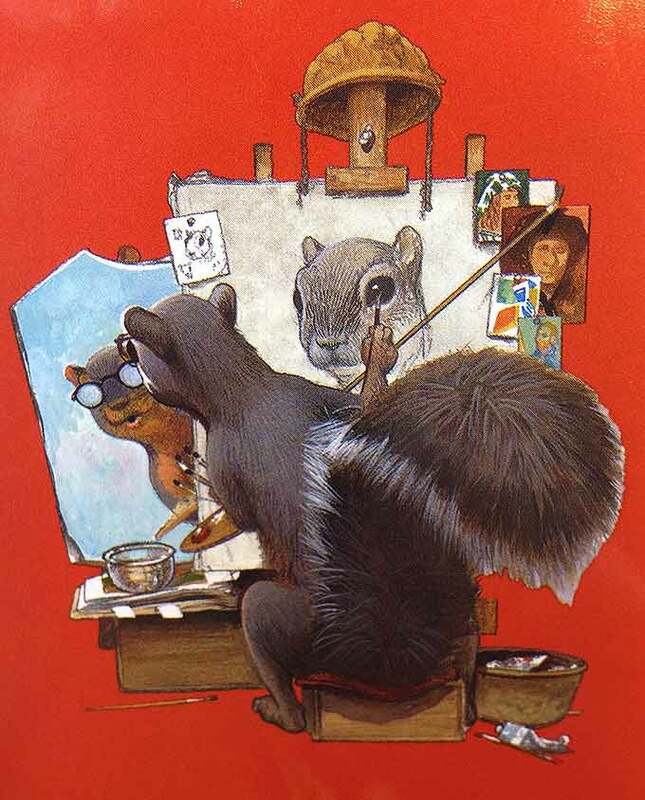 And that picture of that squirrel is outstanding. So good. Will fix these this weekend . For my Grand daughters. What an adorable idea! I'm going to have to do this with my son. Pinned for later! Haha, those pictures made me laugh! What a neat idea - so cute! I think I am going to make these with my daughter. She will get a kick out of them! These are so adorable and I love how easy they are to make!! Such a perfect, fun fall snack! These are awesome! I love that they're easy enough that the kids can help make them too! Those are awesome. Those peanut butter cookies might be hard to find in Australia. They're a terrific idea and love the squirrels too – we don't have those in Aus either! cheers from kid can doodle. I found this at FoodieFriDIY - so cute. Acorns are one thing I miss about no longer living in the East - now I can make my own! Pinned. Thanks so much for dropping by Susan, and these acorns taste better than the ones in the back yard. I'm sure I would miss them too if I moved away. That and the jagged coastline. Have a wonderful weekend!!! These looks so cute! yummy Allie! Such an easy, fun treat! Perfect for any fall gathering! You're so creative, Allie! So cute! Such a perfect novel snack for the fall season, love it! Luci’s Morsels | fashion. food. frivolity. J'adore tes petits biscuits Allie,de la pure gourmandise! bisous,belle journée! Your recipe and pictures are making my mouth watery right now, Allie! I have no other choice but to prepare these acorns soon! How do I dip mini chip in melted chocolate ? Hi Jean - I just hold it between my fingers and dip the flat part, you just need a little melted chocolate to make it stick! Good luck and enjoy! Thanks for dropping by. Try using tweezers - I made a huge batch, maybe 150, two weeks ago - I sterilized the tweezers and it worked like a charm. This is so cute! It would be fun to make with kids! Vanessa - so sorry, just saw I missed responding to this. I've made these as many as several weeks ahead and they've been fine. That's because all the ingredients are shelf stable, as long as you keep them in an airtight container. Hope you enjoy these!!! We’re making these for my granddaughter’s “Alvin” themed birthday party. We’re also making some with Mini Nilla Wafers for the non- peanut butter folks. We think they will all be cute for this Chipmunk themed party! What a great idea Joy. How fun. We get a kick out of Alvin and Chipmunks, perfect to use these little acorns. Nice to provide an alternative for the non-PB crowd too. Very thoughtful. I hope your granddaughter loves her party and has the best birthday ever!!! !